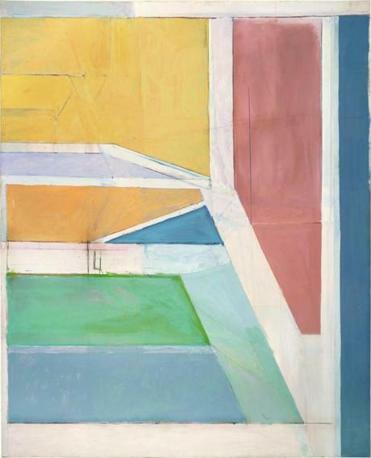 ‘Ocean Park’ series evokes an eternal Calif.
Richard Diebenkorn’s “Ocean Park’’ paintings, such as #79, conjure the sea and sky through expansive sections of blue, tawny yellow, off-white, and green, as well as California’s built environment. The classic Ocean Park paintings are big, vertically oriented abstract canvases with rectilinear and sometimes diagonal partitions that multiply in frequency and intricacy near some of their edges. Tautly constructed, they can resemble giant sheets of paper used for origami, then unfolded and flattened out. But their color relations – Diebenkorn’s inimitable palette of aerated blues set off by yellows, greens, purples, oranges, creamy browns, and no end of intermediate, stonewashed hues – evince mirages of three-dimensional space, and a finely calibrated tension between indoor and outdoor moods. The “unfolding” occurs not just on the surface and in space, however, but in time: Diebenkorn’s built-up surfaces, with their erasures and ghost lines, their scuff marks and pooled stains, draw you into a process, a history of their making. They transform the act of viewing into an elastic, involving experience, not just a sudden, all-at-once hit. You are conscious at every moment that what you see is the culmination of subjective processes at once sensuous and strenuous (observing, feeling, filtering, making, remaking, remaking again) all of which leak back into your experience before them. Diebenkorn was the preeminent West Coast painter of the postwar period. At his best, he was the equal of any of his better known East Coast peers. But of course these cherished categories – East Coast, West Coast, Northern, Southern – when they’re not functioning as useful clues to the vagaries of critical reception, are really just picturesque clichés. In Diebenkorn’s case, it’s well to remember that the painter who made the biggest mark on him in his early years – Edward Hopper – was as East Coast as they come. And that Diebenkorn shared many of the same concerns and abiding influences as his better known East Coast peers, from Willem de Kooning to Ellsworth Kelly. The Ocean Park paintings, building on Diebenkorn’s earlier figurative paintings, evoke California’s low-slung built environment – its tendency to shape and divide even the most enveloping outdoor spaces into discreet geometrical units. But their expansive sections of blue, tawny yellow, off-white, and green also conjure the unfettered sea and sky, the limb-loosening landscape. Diebenkorn was profoundly affected by air travel, and the flattening effect, visually, that elevation has on the land and sea below. Man-made divisions become more pronounced. Patterns emerge in a kind of natural process of abstraction that chimed seductively with developments in modern art. In this (and in much else), Diebenkorn was a spiritual cousin to his faraway contemporary Fred Williams, Australia’s great 20th-century painter. Temperamentally, like Williams, he savored difficulty. What’s more, although they were modernists to the core, both Diebenkorn and Williams found their sweet spots right at the line between figuration and abstraction. Both also rejected expressionistic freedoms in favor of classical restraint. As such, they were heirs to Cezanne, Matisse, and Mondrian – distilling and containing emotion in order to intensify it. The latter, in particular, with its vertical partitions of different widths, its washed-out blue and turquoise, its subtle diagonal inviting the eye to read spatial recession, and its inside/outside dynamic, looks like a prototype for the whole “Ocean Park” series. Art is wonderful like that. One artist opens a jammed attic window – almost absent-mindedly; other things are crying out for his attention – and half a century later another artist on another continent makes beauty come parading through it. Diebenkorn’s way with color is the source of his greatest originality. He had a sixth sense for how to contrast the coolness and warmth of colors and for the interplay between hardness and softness, degrees of aeration. In places, he would do as Mark Rothko did: lay one big expanse of a single hue over two layers of slightly differing hues, one warm, the other cool. The result? An exquisite emotional pitch akin to the final, descant-accompanied verse of a melancholy hymn. Elsewhere, Diebenkorn makes tough, vibrant colors miraculously cohere with milky, bashful hues. In Ocean Park #43, for instance, a dissonance bordering on vulgarity between turquoise and grass green on the right is subdued by stripes of soft denim blue and creamy tomato soup red. On the far side of an expanse of murky off-white, the same painting harmonizes rusty brown, royal blue, and lilac. There is a severity in Diebenkorn’s best paintings – a tingling sensation of strength held potently in reserve – that tempers the rush of Californian hedonism his paintings inevitably evoke. Not unlike that great painter of indoor life, Edouard Vuillard, the expansive, outdoor-oriented Diebenkorn can seem to be involved in an endless game of spiritual division, of moral apportioning: In how many ways, and with how much poetry, can a rectangle be divided into smaller units of varying size and color? The answers come at you like lessons in how to live. Undertakers of modern art contend that Diebenkorn was the end of a line – the last important studio painter still concerned with building on the inheritance of Cezanne, of the School of Paris, of Mondrian, of de Kooning. They may or may not be right. But how wonderful it is that, as recent art degenerates into a concatenation of one-off sensory or intellectual “hits,” Diebenkorn’s paintings are still there to remind us of the value of depth, duration, and a beauty that is always just short of replete.